Do games make kids smarter? The answer to this depends on what smarter actually means. While experts rarely agree on what intelligence is, extensive research has been done to show that games do have a positive effect on a variety of cognitive skills. Whether it's learning to think logically, improving counting skills, or fine tuning reasoning and prediction skills, numerous studies show that games improve skills that kids need for academic success. A University of California at Berkley study worked with seven to nine year-old kids with low average IQ's from low socioeconomic backgrounds. Researchers provided training that focused on both reasoning and processing speed. 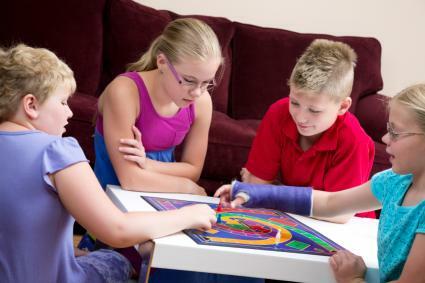 Kids played types of games (video, card, and board games) under researcher supervision, twice a week, for 60 minutes for eight weeks. The results suggested that training showed significant increases in both reasoning skills and processing speed. These improvements were evident in both the researcher's tests and in the classroom. Another study from Carnegie Mellon University showed that low-income four year-olds who played number line games, such as Chutes and Ladders, showed significant math improvements. The kids who played number line games improved in four different areas of math ability to the point that their math skills were indistinguishable from the superior skills of their higher-income peers in the classroom. The results were still evident nine weeks after testing ended. Brain games, games that claim to train the brain in the same way that exercising trains the muscles of the body, have been shown to increase a person's working memory. Working memory is the part of the memory that contains everything you are thinking about right now. Working memory allows you to keep ideas organized and maintain attention, so that you can learn in the midst of distractions. Increases in working memory leads to increases in I.Q. However, if you're hoping playing lots of brain games will make you super smart, that's not likely. Although playing a brain game will make you better at that specific task, the results don't generalize elsewhere to make your overall IQ improve. Players of point-and-shoot video games tend to resolve mental conflicts more quickly, as well as to be able to track more objects at once than non-players. Players tend to be better multi-taskers and are able to switch their attention between tasks more quickly than non-players -- a skill that has benefits in multiple daily skills. Players also overwhelming show better spacial relations abilities. Players show increased perception and reaction times. A meta-analysis of the research done on video games showed that the specific skill sets of gamers were better indicators of success in STEM (science, technology, engineering, and math) areas than were the same academic courses. In addition, video games may help children develop problem solving skills - the more adolescents played strategic role-playing games, the better their problem-solving skills and grades in school. The improved quickness of visual problem-solving has been shown to generalize to audio tasks. Different games can improve different areas of kids' cognitive and social abilities. All types of games, in moderation, can have a beneficial effect on children's intelligence, depending on the type of game, how it is played, parental involvement, and the variety of games played. Clue can teach logical thinking. Chutes and Ladders -- or any game that requires moving through a series of numbered spaces -- can improve math skills. Mastermind can teach critical thinking and reasoning skills. Mancala can teach kids to detect patterns, plan ahead, predict outcomes, and learn from experience. Chess, the board game shown to have the most definitive effects on intelligence, exercises both sides of the brain, increases creativity and originality, impoves memory and concentration, and can even raise IQ and help to prevent Alzheimer's. Minecraft can teach logic and problem solving skills as well as encourage creativity. When it comes to games, choose a variety including both technological and non-technological games. Allow your kids to play games by themselves and games with others. To get the most out of game time, talk to your kids about what they are playing and what they are learning. Discuss the skills that are necessary to win a game and talk to them about how to handle losing. Games are only tools. What you and your child do with the games will determine how much of an effect the game actually has.